Home / Humble student of the markets / Recession jitters: The new fashion? In his outlook for the national economy, UCLA Anderson senior economist David Shulman notes that while the global economy started out strong in 2018, signs of its weakening will likely be everywhere by year’s end. “The weakness is being amplified by the protectionist policies being employed by the Trump administration and the uncertainties associated with Brexit,” he writes. “This economic weakness has triggered a major contraction in global interest rates, making it difficult for the Fed to conduct its normalization policy, and has put a lid on long-term interest rates. “After growing at a 3.1 percent clip on a fourth-quarter-to-fourth-quarter basis in 2018, growth will slow to 1.7 percent in 2019 to a near-recession pace of 1.1 percent in 2020,” Shulman adds. 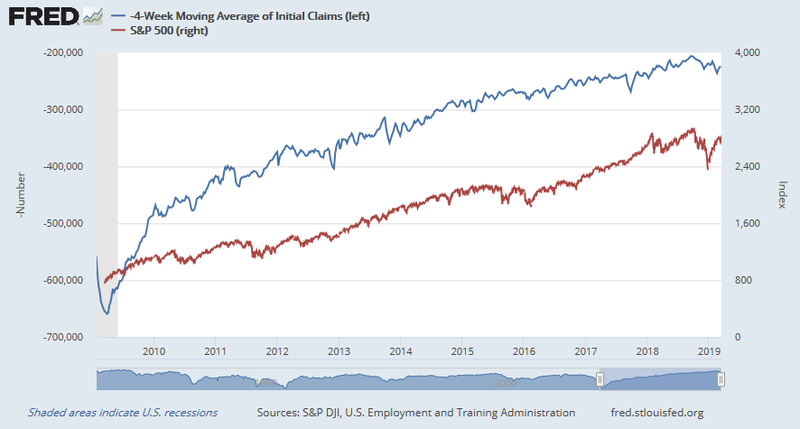 “However, by mid-2021, growth is forecast to be around 2 percent.” Payroll employment growth will decline from its monthly record of 220,000 to about 160,000 per month in 2019 and a negligible 20,000 per month in 2020, with actual declines occurring at the end of that year. In this environment, the unemployment rate will initially decline from 3.9 percent in January to 3.6 percent later in the year and then gradually rise to 4.2 percent in early 2021. Antonio Fatas, the Portuguese Council Chaired Professor of European Studies and Professor of Economics at INSEAD, rhetorically asked in a blog post if low unemployment is sustainable. In other words, this is as good as it gets for unemployment and the economy? Past turns in the unemployment rate have been followed by recession. The latest Jobs Report saw the headline unemployment rate decline from 4.0% in January to 3.8% in February, which is constructive, but the internals of the report don`t appear as rosy. RecessionALERT pointed out that 60% of states have reported an increase in unemployment rate. The Leuhold Group also sounded a warning for equity investors. 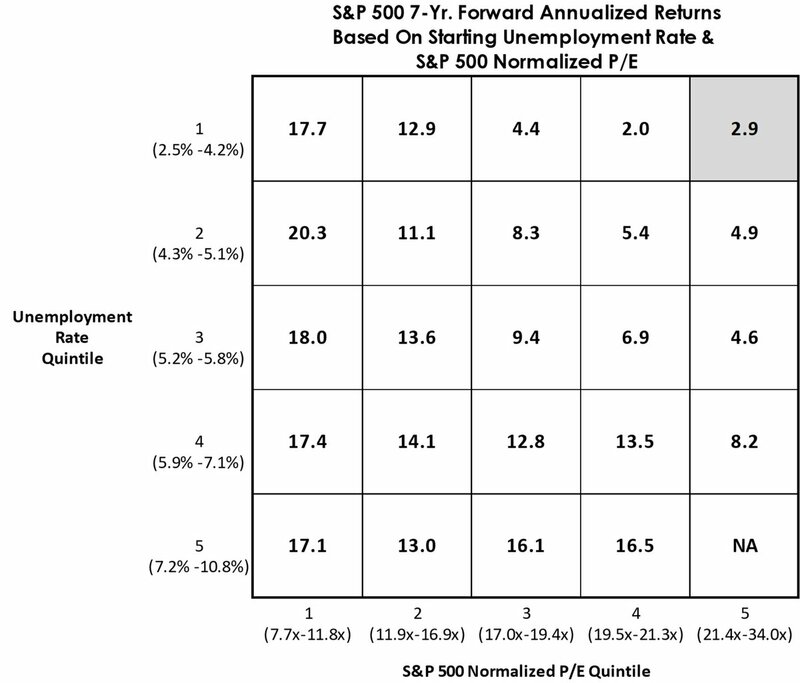 The combination of low unemployment and top quintile valuations is unfriendly for long-term (7-year) returns. 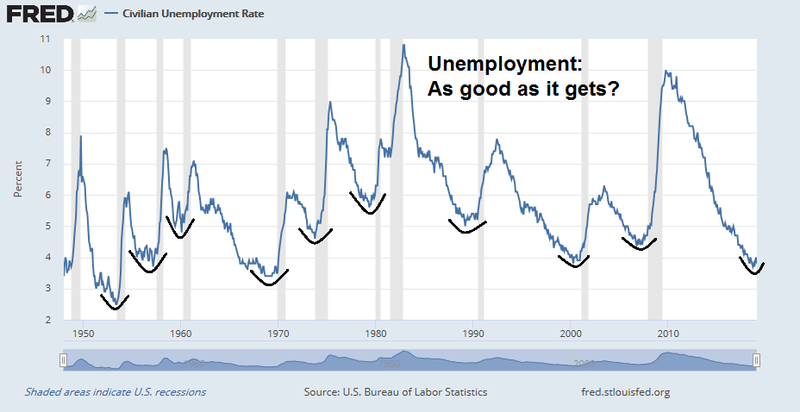 Returning to Fatas` analysis, he observed that, in the past, low unemployment rates were unsustainable, and they have displayed a V-shaped pattern at the lows. All cycles display a V-shape evolution for unemployment. Unemployment reaches its lowest point around 12 months before the recession and, in most cases, unemployment is already increasing in the months preceding the recession. What is interesting is the absence of a single episode of stable low unemployment (or full employment). It seems as if reaching a low level of unemployment always leads to dynamics that soon generate a recession. 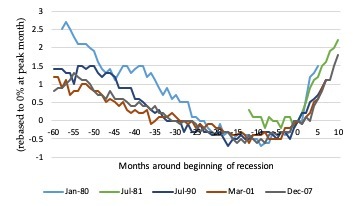 Recessions die of old age if “age” is measured in terms of how much economic slack is left. If this pattern was to be repeated, the US must be today very close to an inflection point, a recession. We can quantify this intuition by relating this result to an academic literature that analyzes the determinants of the tail risk of unemployment (or GDP) changes. This literature looks at the determinants of worst potential outcomes over a specific time window. Some examples: Cecchetti (2008), Kiley (2018) Adrian, Boyarchenko, and Giannone (Forthcoming). Empirically this is done with the use of quantile regressions. In this case we are interested in the tail risk of sharp unemployment increases, which are associated with recessions, and I will capture that by coefficient on the 90th percentile of the distribution in a quantile regression (Fatas (2019)). What makes low unemployment unsustainable? To say that low unemployment leads to recession is similar to saying that expansions die of old age. Fatas attributes the unemployment V to the buildup of excesses in the economy. In other words, low unemployment is just an indicator that we are in the late cycle of an expansion. The academic literature tends to emphasize two set of variables: those associated to macroeconomic imbalances (such as inflation) and those associated to financial imbalances. Interestingly, the introduction of these variables in the quantile regressions above makes the above effect go away (see Fatas (2019)). In particular, once we control for credit growth, it is not any longer the case that low unemployment is a good predictor of the tail risk associated to recessions (we still observe a reversion to the mean but we do not obtain a larger coefficient for the p90 quantile). This result suggests that recessions follow periods of low unemployment because imbalances are built during those years. What is interesting is that the evidence shows that this is always the case, that the US economy has never managed to sustain a low rate of unemployment without generating the imbalances that lead to a recession. If history is an indicator of future crisis, and given the current low level of unemployment, a recession is likely to be around the corner. Fatas uses the Chicago Fed’s National Financial Conditions Index (blue line) to measure financial excesses. So far, this indicator, along with the St. Louis Fed’s Financial Stress Index, remains tame. However, the real excesses of this expansion cycle can be found outside the US. 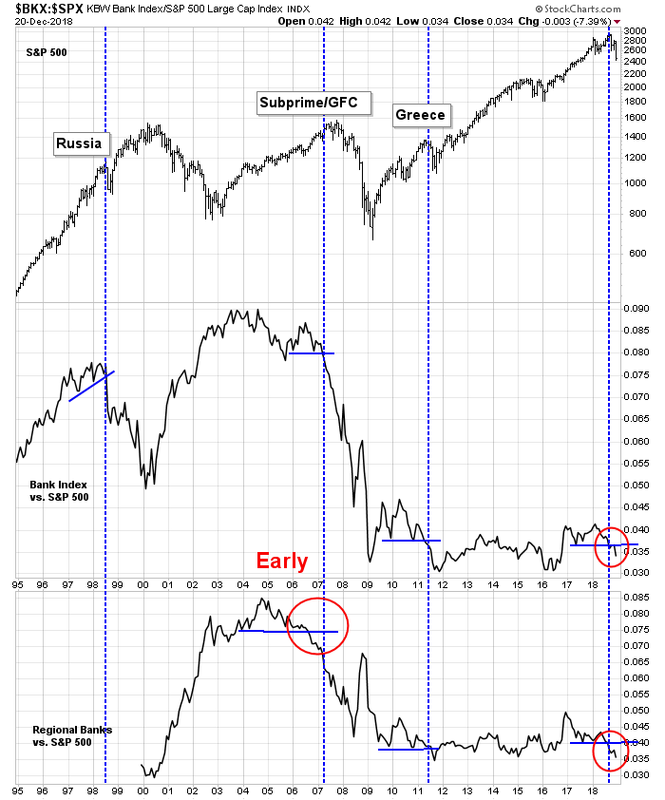 As I have noted before, a technical breakdown in the relative performance of bank stocks have signaled bear markets or financial crises in the past. The worries of this expansion cycle have been dominated by the increasing fragility of the Chinese economy. If China were to stumble, the rest of Asia would tank, and so would the major resource producing countries like Australia, Canada, New Zealand, and Brazil. 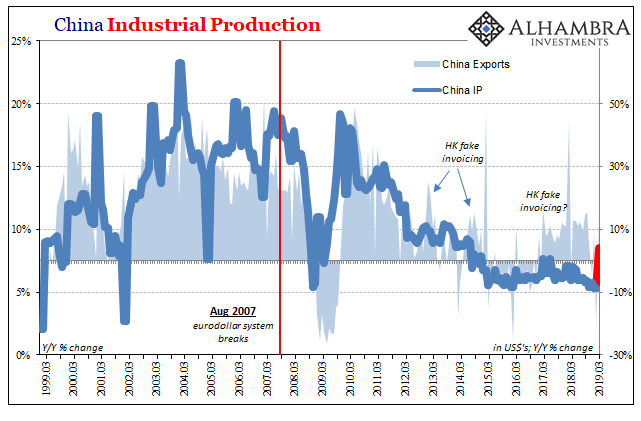 Europe is also highly vulnerable to a China slowdown. 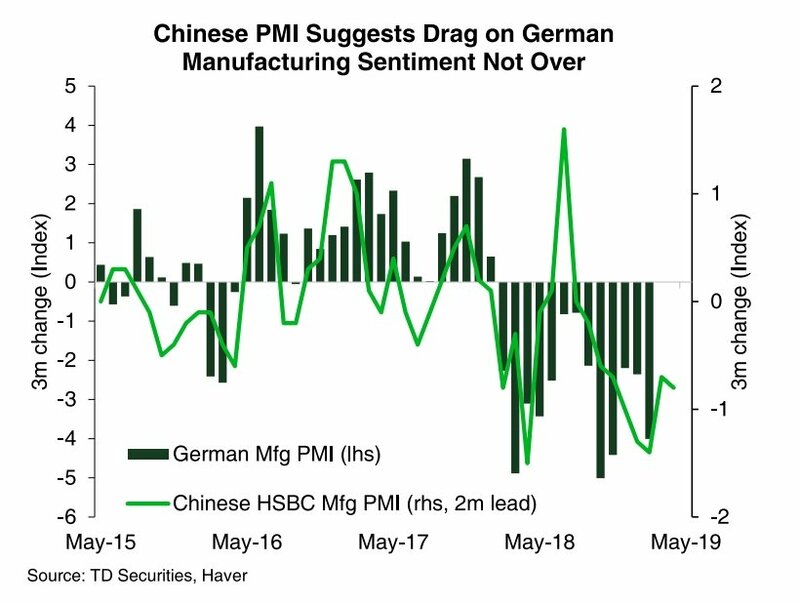 China Beige Book pointed out that China’s headline growth has a 0.81 correlation with Germany’s IFO Index with a one-month lead. 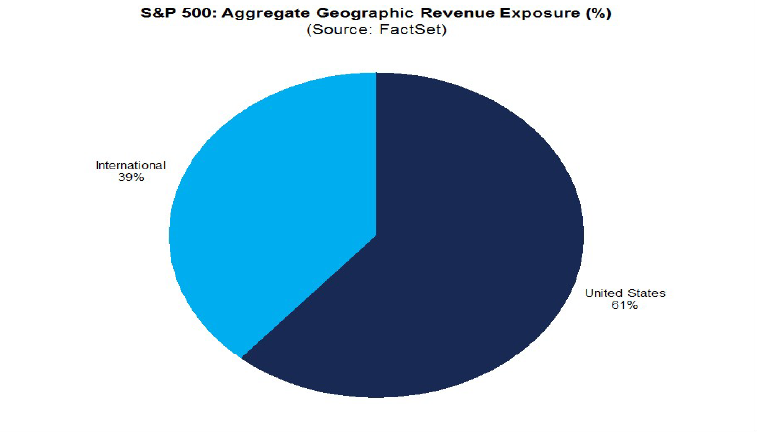 While the American economy is not highly exposed to trade, I remind readers that 39% of S&P 500 sales come from foreign sources. Non-US economic weakness will have an outsized effect on US equity prices, especially if the global investors pile into USD assets because US is viewed as a safe haven. A rising USD would have the double whammy of further depressing operating margins owing to poor exchange rate translation. 3 negatives: Interest rates, housing, and credit conditions. 1 neutral: Real retail sales per capita. 2 mixed indicators: Money supply and the yield curve. While the long leading indicators that measure corporate sector has been healthy, the household sector is not behaving well. Real private residential investment to GDP has been declining. The cyclically sensitive housing sector has been weak. While monthly releases can be noisy, single family housing starts is one of the least volatile data series, and it peaked out about a year ago. Real retail sales per capita has tended to peak ahead of past recessions. The last high was in October, and this indicator has been declining ever since. 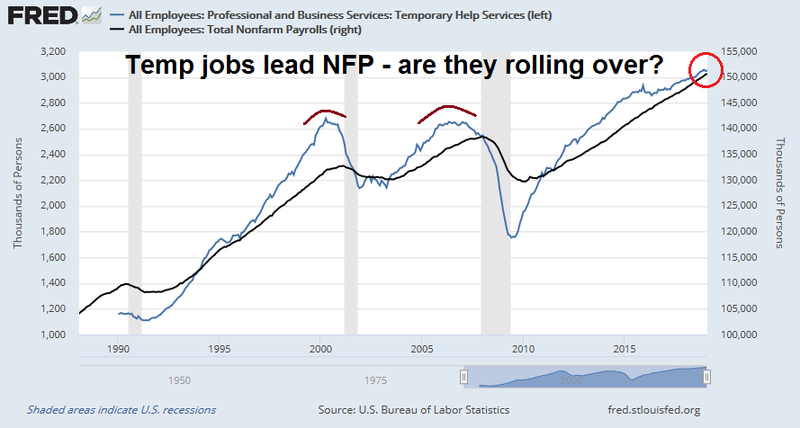 In addition to the warnings raised by NDD, I would add that leading indicators of employment appear to be rolling over. Weakness in employment raises the concerns about a V-shaped turnaround in the unemployment rate pointed out by Antonio Fatas. Temporary employment growth has historically led Non-Farm Payroll in the last two cycles, and temp jobs seem to be topping out. As well, the quits rate has been a useful indicator of labor market health, but it is part of the JOLTS data, which is reported with a time lag. 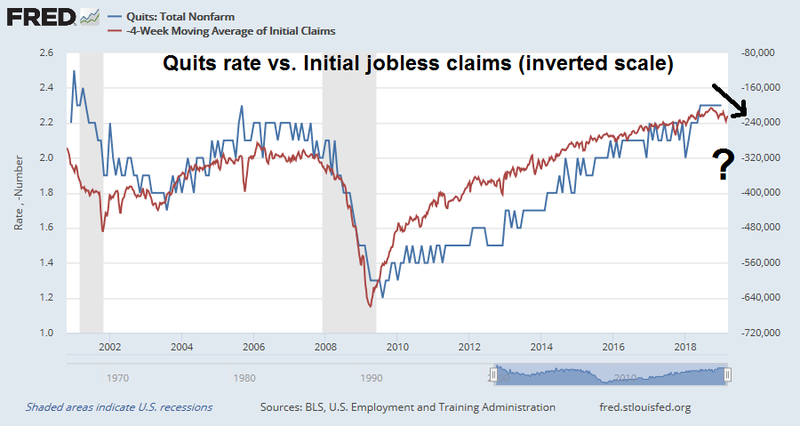 This chart of the quits rate (blue line) and initial jobless claims (inverted scale, red line) suggests that the quits rate may be due to decline in near future. If this is indeed the inflection point, then it would indicative of a weakening job market. As an indication of the usefulness of the timely initial jobless claims, initial claims (inverted scale, blue line) have been remarkably correlated with stock prices during this expansion cycle. 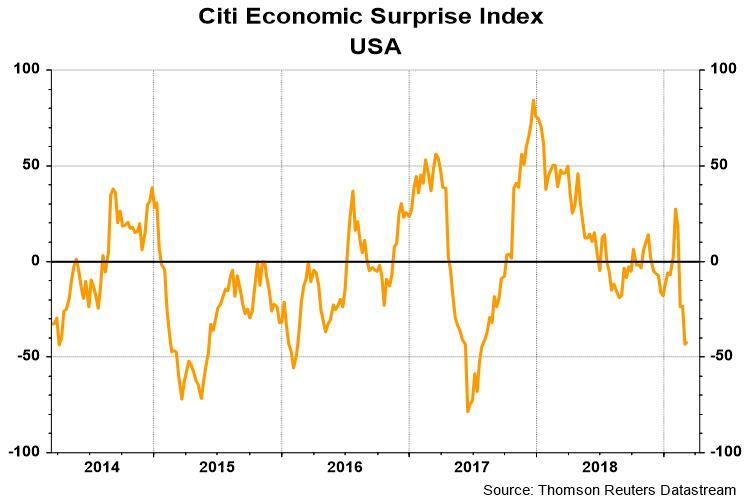 The Citigroup US Economic Surprise Index, which measures whether macro-economic data is beating or missing expectations, has been cratering, indicating the misses are worsening. Business Insider reported that Morgan Stanley sounded a similar warning. 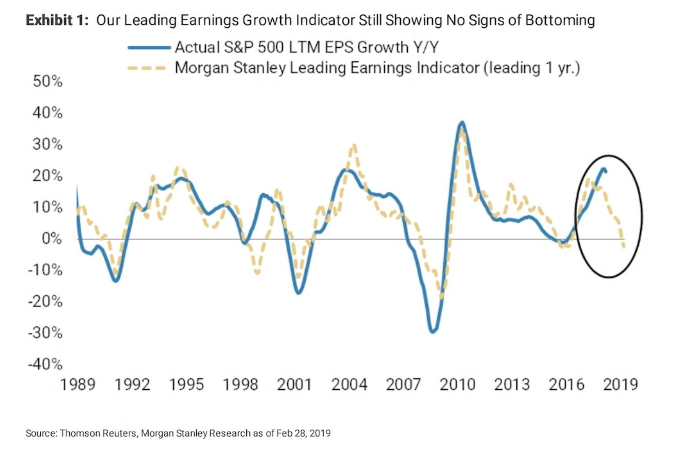 Leading indicators are declining, and investors should be prepared for falling earnings growth. FactSet reported that the Q1 negative guidance rate is 74%, which is above the 5-year average of 71%. In addition, Business Wire reported that a review by Gartner Inc. of earnings calls revealed a high degree of management anxiety about a downturn. 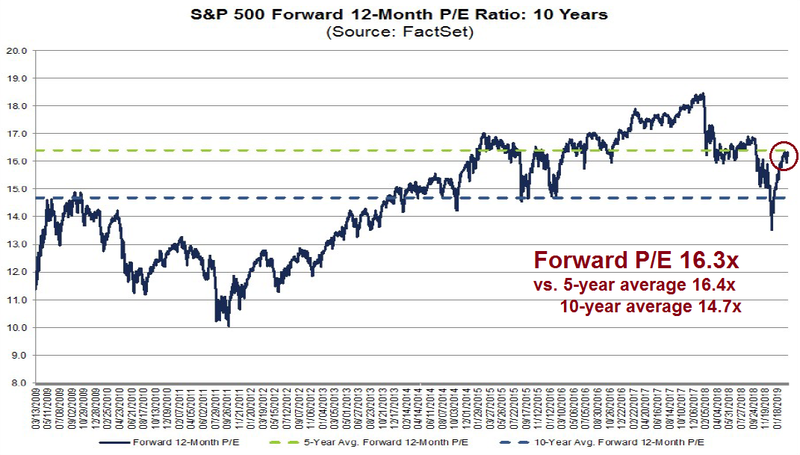 The S&P 500 trades at a forward P/E ratio of 16.3, which is just below its 5-year average of 16.4 and above its 10-year average of 14.7. In this environment of likely downgrades to the economic outlook and elevated valuation, investors need to be prepared for the possibility of disappointment and de-rating in the weeks and months ahead. 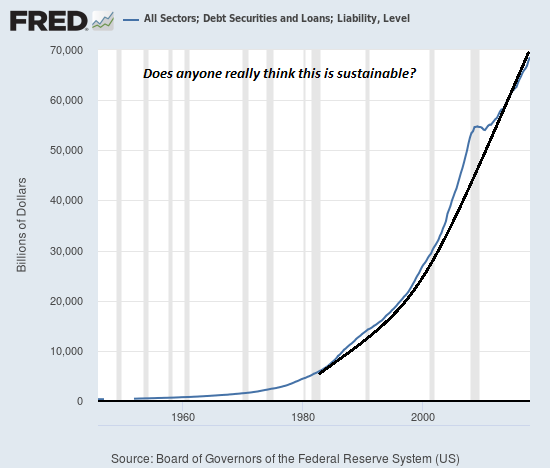 What about the Fed? Won’t it rescue the stock market? While we will hear more from the Fed at its upcoming FOMC meeting, it is difficult to see how its policy could become any more dovish in light of the current environment. 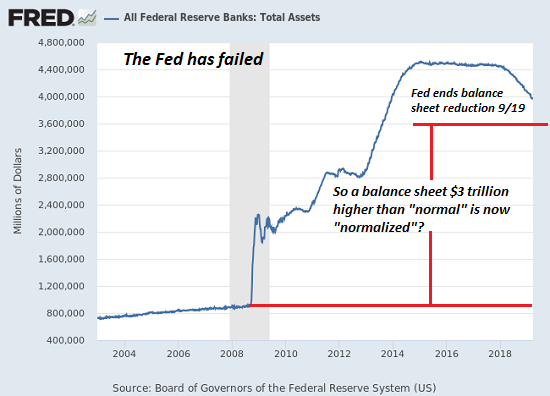 The Fed’s past behavior indicates that it will ride to the rescue should stock prices crash, it is nevertheless constrained by its dual mandate of maximum employment and stable prices. As the chart below shows, while core CPI (black line) has softened, both median CPI and sticky price CPI are stubbornly firm. 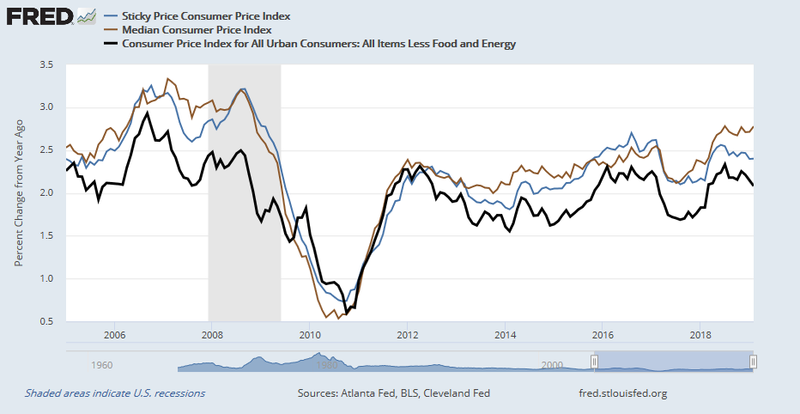 In fact, median CPI is at or near a cycle high, and these trends in inflation could handcuff the Fed from easing monetary policy should the economy weaken. There is a Powell Put, but expect the strike price to be lower than current market levels. The Fed is likely to tolerate minor corrections, just not market crashes. In conclusion, dark clouds are appearing on the economic horizon. While they do not necessarily mean that a hurricane is ahead, investors have to be prepared for storm fears, and act accordingly. I reiterate my belief that any growth scare is likely to be temporary. There are few signs of excesses in the US, if unwound, that are likely to plunge the American economy into recession. Most of the risks come from abroad. China is the main source of global concern, and it has already begun another stimulus program, and Beijing is going to pull out all stops to ensure the economy is not tanking ahead of its 70th anniversary of Mao`s revolution in October. Therefore any growth jitters are likely to be ephemeral, and any resulting market weakness will only be only corrective in nature. Looking to the week ahead, the market staged a remarkable rally last week as indices moved from one end of the Bollinger Band to the other. 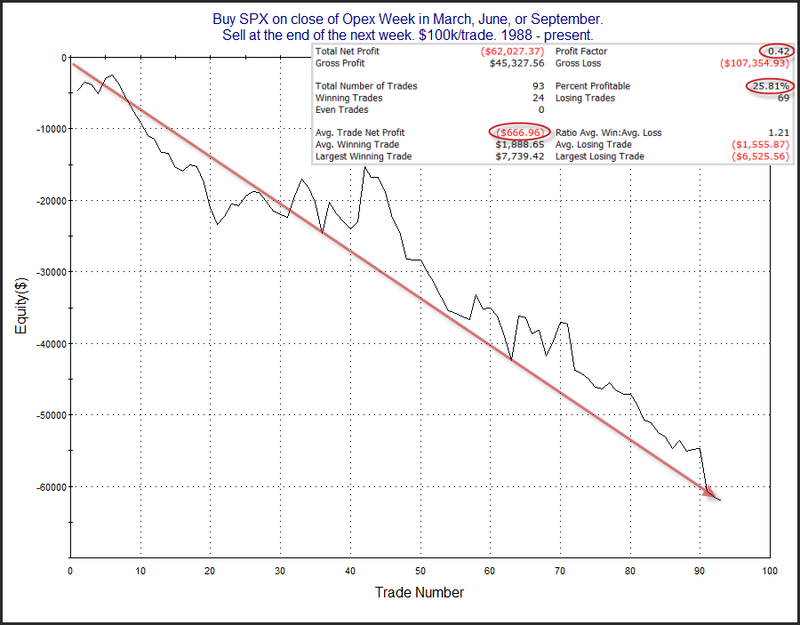 The VIX Index (bottom panel) fell from the top of its BB to the bottom in five days. At the same time, the S&P 500 rallied from the bottom of its BB to the top. 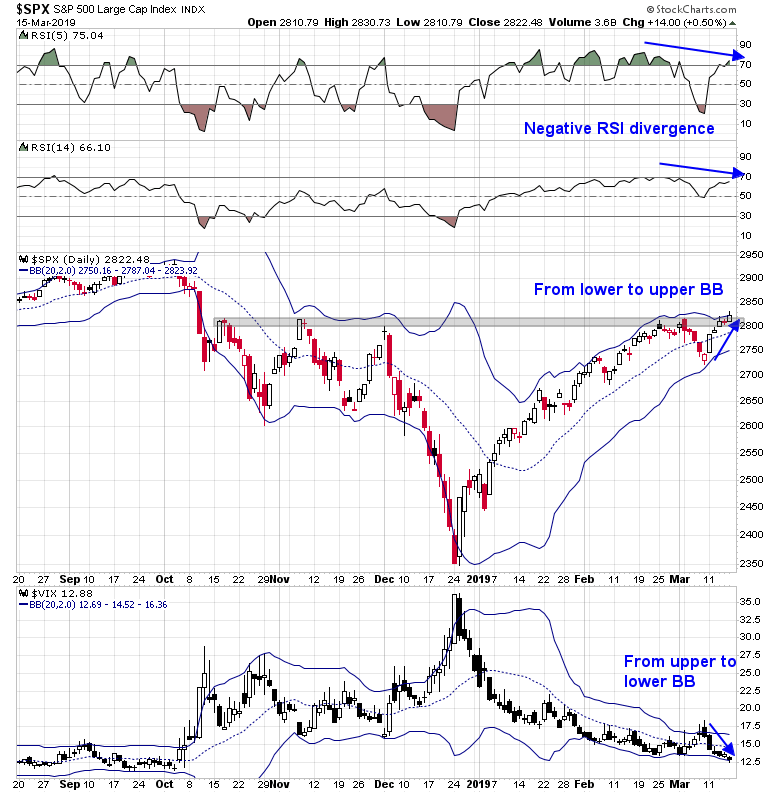 The market is not testing a resistance zone while exhibiting negative RSI divergences, which is a sign calling for caution. Another worrisome sign is the narrowness of market cap leadership. 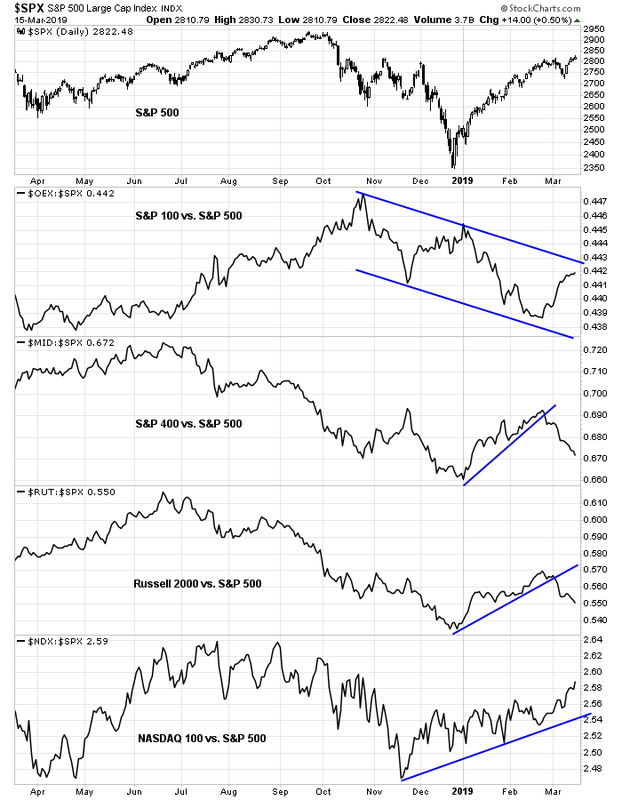 The relative performance of the megacap S&P 100 is in a relative downtrend, and so are the mid and small cap stocks. The only index showing any leadership are the NASDAQ 100 stocks, indicating narrow leadership. Selected breadth indicators are also displaying a series of negative divergences as well. 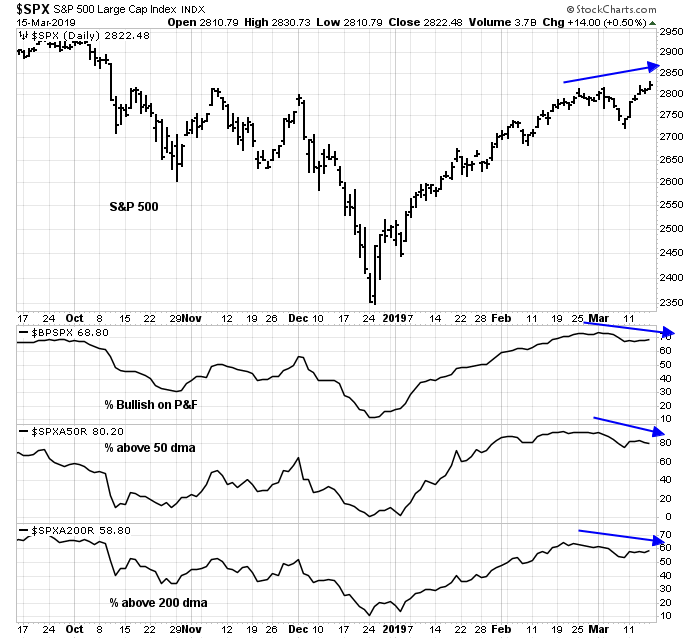 % bullish, % above their 50 dma, and % above their 200 dma are making lower highs even as the S&P 500 made higher highs in the past two weeks. 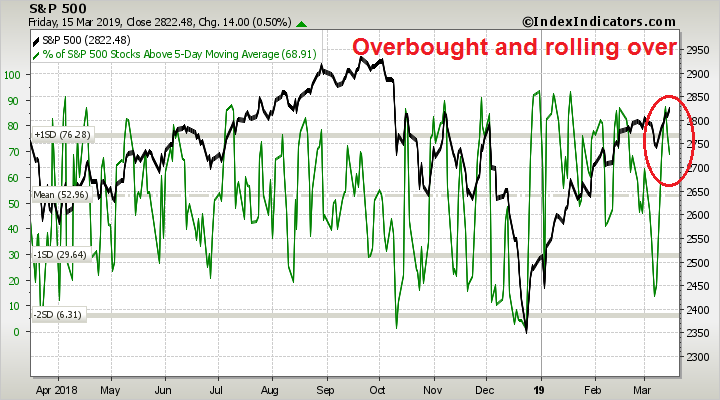 Short-term breadth was overbought and rolling over, which is often a signal of short-term weakness. Notwithstanding the unpredictability of the market reaction to next week`s FOMC meeting, the market also faces historical headwinds in the upcoming week. Rob Hanna at Quantifiable Edges observed that the week after quadriple witching tends to have a bearish bias. My inner investor is neutrally positioned at roughly his target asset allocation weights. 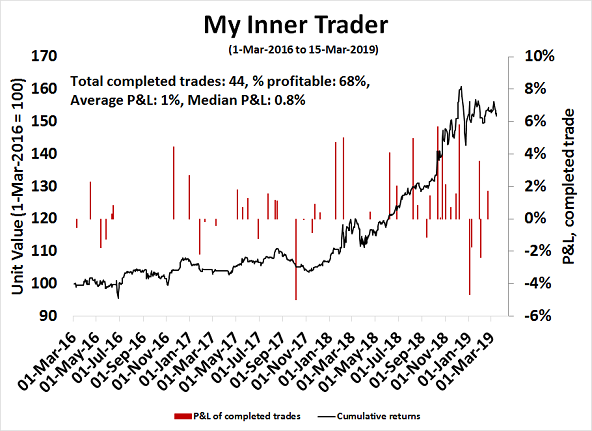 My inner trader has been leaning bearish and he increased his short positions as the market rallied last week. Previous The secret of cryptocurrencies revealed! Next FOMC preview: Peak dovishness?